In April 2013, Cambridge was one of six communities awarded the inaugural Robert Wood Johnson Foundation’s “Roadmaps to Health Prize” for developing innovative strategies to improve community health.One of the featured Cambridgecommunity partnerships was the Agenda for Children (AFC) Literacy Initiative. In 2002, The AFC Literacy Initiative launched the “Let’s Talk…It makes a difference” campaign, which aims to help children enter school primed to succeed by providing parents and caregivers with knowledge, skills and materials to support their children’s language and literacy development. This program offers an array of services and activities for families with children ages birth to 5 years old, all of which stress that parents are their children’s first teachers. Free workshops help parents learn the importance of talking, interactive reading, and storytelling and provide practical techniques to encourage high-quality parent-child verbal interaction. The program also provides home and maternity ward visits, book distributions, and playgroups. Since the Let’s Talk campaign’s inception, AFC has partnered with ICH to support their continuous program improvement efforts. ICH provides ongoing evaluation assistance using a participatory approach. ICH and AFC staff work together to implement evaluation activities, including fidelity checklists and activity logs for the Literacy Ambassadors, Talk Workshop and Reading Party surveys, and telephone interviews with a sample of home visit participants. ICH and AFC staff’s close collaboration allows the evaluation findings to critically impact program enhancement and sustainability by highlighting the program’s effectiveness and community impact. Cumulative results from 2007-2011 reveal that the program is having a profound impact on Cambridge children and families. 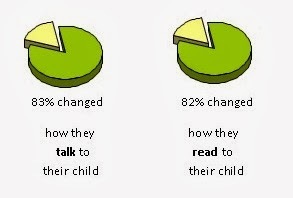 Through surveying parents after the talk/read workshops and home visits, we found that parents increased their knowledge of the importance of talking and reading with their children and demonstrated significant behavioral changes around talking and reading with their children at least 1 month to 3 months after the home visits. Agenda for Children is improving Cambridge’s community health by working to ensure all of its children are literate. Because many Cambridge families have multiethnic or immigrant backgrounds, AFC’s multilingual and multicultural staff are crucial for improving literacy and connecting families with community resources. ICH’s long partnership with the AFC Literacy Initiative has been a fruitful one, as we have seen how our program evaluation support has helped AFC progress and make a significant impact in the community.